The source of high-energy cosmic rays has been a mystery. The SWIFT spacecraft detects Gamma Ray Bursts with a Burst Transient Detector, then quickly focuses more powerful instruments to observe them in detail. GRB060614 shows qualities of both short and long bursts. 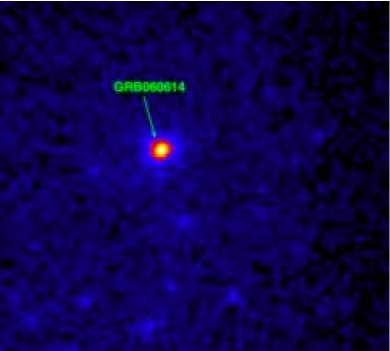 It is a new class discovered by SWIFT, a hybrid Gamma Ray Burst. Short Gamma Ray Bursts typically last for milliseconds, and result from the merger of two smaller objects. Long bursts are theorised to result from the core of a star collapsing into a Black Hole. Long bursts last for two seconds or more, and GRB060614 lasted 102 seconds. The light curve resembled a short burst, as if the merger were stretched out in time. Some astronomers believe that GRB's can be used as standard candles for cosmology. Using Type Ia supernovae led to claims of "dark energy." Before GRB's are used this way, we need to understand their causes much more. Look at the fix supernovae have got us into! Thank you Q9 for stopping by during your busy day. Thank you for all the nice things you have said since this blog started. Best wishes to you and everyone out there. Here's looking forward to a great new year of cosmology and scientific discsussion here and at SciGuy! Merry Xmas, Happy New Year and God Bless! Oops, forgot to attach the link to my name! Thanks, Ttyler. I've put you on the blogroll as Sci Guy, if that is ok. I hope to hear good news from Houston (and hope I can contribute something too). Merry Christmas!